In early April, members of several partner organizations assisted Department of Natural Resources staff to establish five small apple and crabapple tree plots, totaling 85 trees. These plots will provide important habitat value for local wildlife over the next several decades. The trees were planted on state-owned properties in Columbia County and funded through the federal Pittman-Robertson grant, which allocated approximately $175,000 to establish plantings for wildlife throughout Wisconsin. Properties that will benefit from these and previous plantings include Columbus, French Creek, Pine Island, Grassy lake, Mud Lake, Duck Creek, Swan Lake, Paradise Marsh, Pete Helland, and Hampden Marsh wildlife areas. “A 12-tree plot costs a little over $1,000 with the use of volunteer hours and lifespan for these trees is approximately 50 – 60 years, so it’s a great investment for the money spent,” said Al Ramminger, Columbia County DNR wildlife technician. 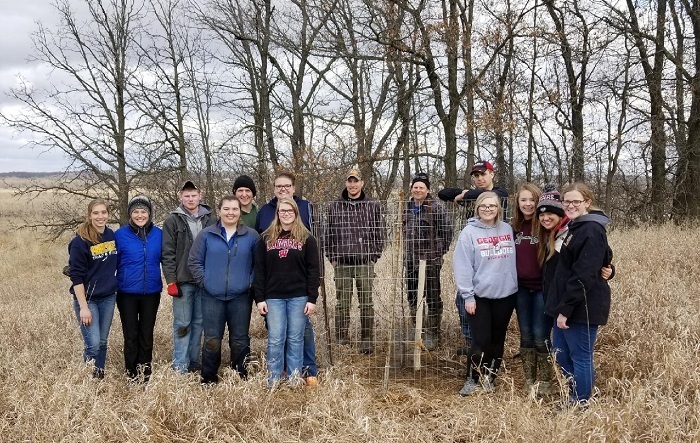 Partner organizations including the Ruffed Grouse Society, Portage and Deforest Boy Scouts, Pardeeville FFA, Pheasants Forever, Wisconsin Waterfowl Association, Wild Turkey Federation and Whitetails Unlimited provided support and volunteer labor for the project. Some of these organizations are willing to assist with the future maintenance of watering and pruning tree limbs. One group participates in the Adopt-a-Wildlife-Area program, in which organizations join forces with the department to manage public land. The department selected planting sites to add diversity to the properties and complement natural habitat areas frequented by wildlife. The trees will attract pollinators, birds and small and large mammals throughout the seasons. Several sites were also selected to give disabled hunters easy access.